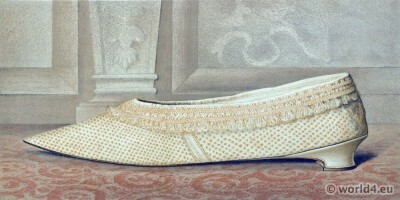 17th century shoe of Lady Mary Mordaunt. Baroque period. 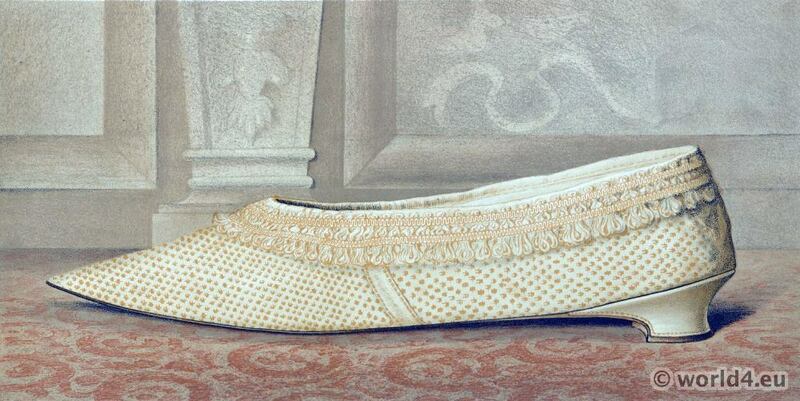 THIS shoe also belonged to Lady Mary Mordaunt. The material is the same as that of the black one, but its bright colour and elaborate gimp trimming transforms it into a smarter and more stylish shoe. The point of the toe is so extremely sharp and elongated, that it had to be well stuffed with cotton-wool to preserve the shape. This entry was posted in 17th Century, Baroque, Shoes and tagged Baroque fashion, Ladies' old-fashioned shoes on 8/24/14 by world4.